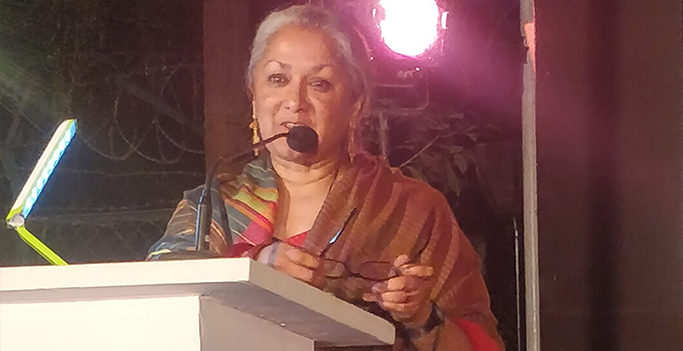 Last Friday evening (February 8, 2019), The David Sassoon Library Grounds witnessed a houseful celebration of literature, captivating the young and old, alike. 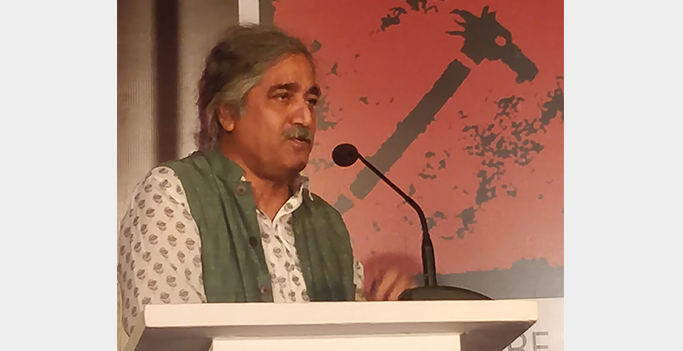 First on stage was Ashwani Kumar, co-founder of Indian Novels Collective, addressing the gathering. 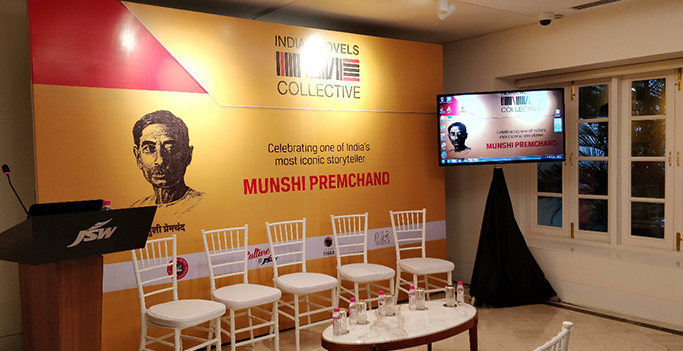 He introduced the Novels to the audience and highlighted the need to experiment with genres to popularise Indian classics. 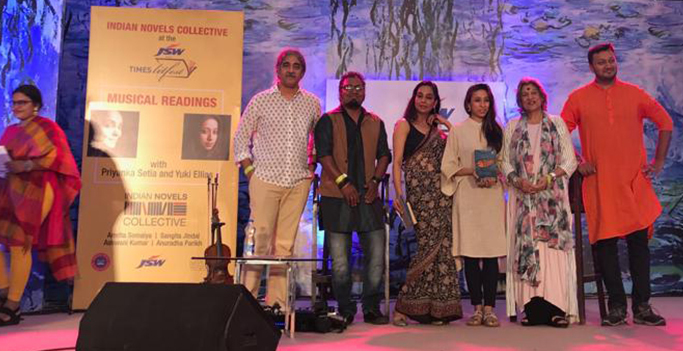 The audience was allured by the fascinating collaboration of Vidya Shah, Priyanka Setia and Indian Novels Collective. 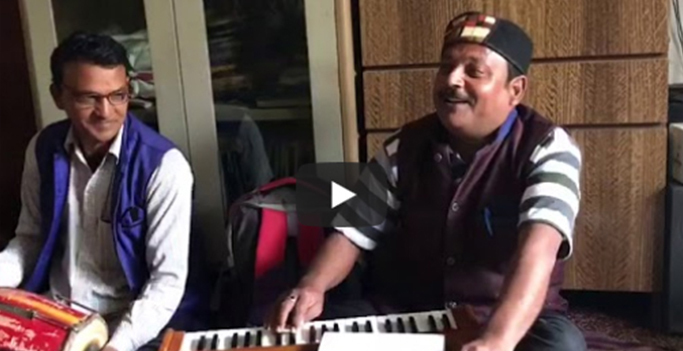 Vidya Shah has been exploring women through her music since many years now. 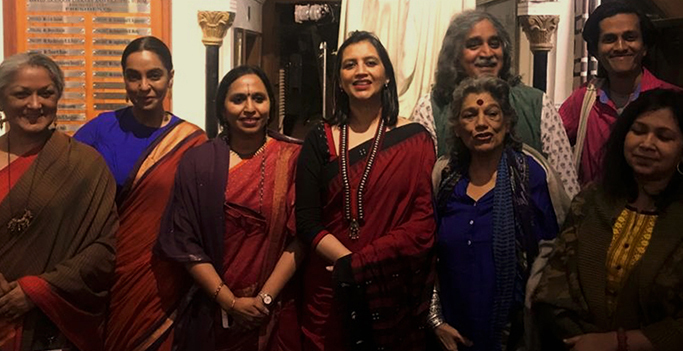 In 2009, she directed a two-day exhibition and music concert — ‘Women on Record’, celebrating music of women in the gramophone era, in which she paid a tribute to iconic female voices (of that era) by performing their music. 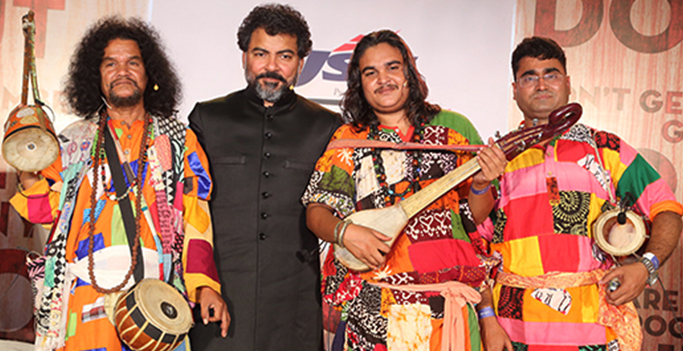 Looking back, it fit perfectly with the theme that Indian Novels Collective wanted to celebrate this year at the Kala Ghoda Arts Festival. 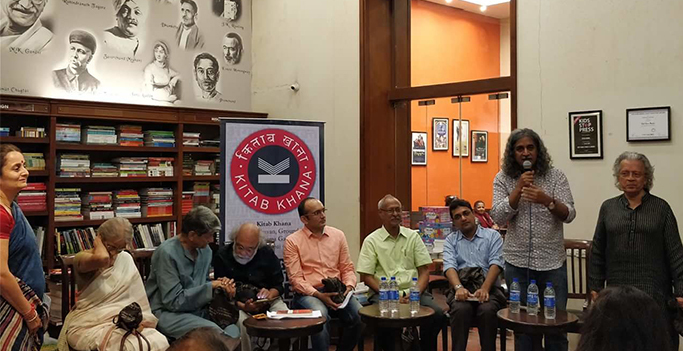 The evening commenced with a tribute to Krishna Sobti and her fierce depiction of Mitro followed by Damodar Mauzo’s ‘Karmelin’. 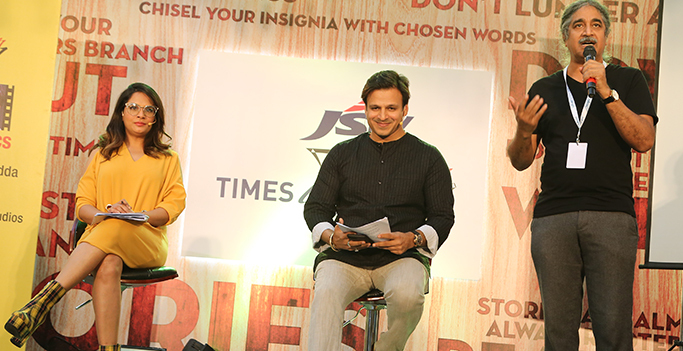 Priyanka Setia enticed the audience with the characters’ unapologetic sexuality. On the one hand, Mitro unabashedly expresses her sexual desires while Mauzo’s Karmelin uses her sensuality in a calculative and controlled manner. 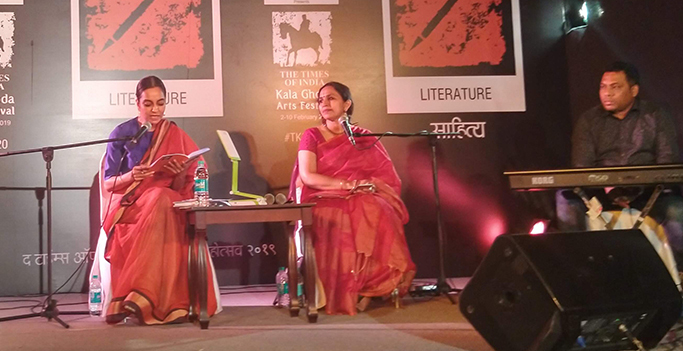 The excerpts read from the Novels helped the audience capture the essence of the characters. 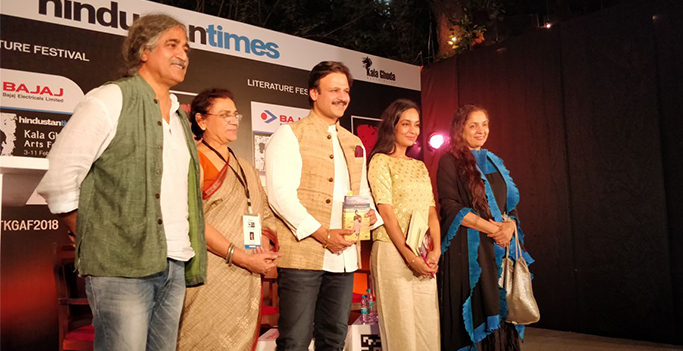 Vidya Shah corresponded to these characters with some beautiful Ghazals from Janki Bai’s Raseeli Tori Akheeya and Begum Akhtar’s Humari Atariya Pe followed by Humko Mita Sake for Karmelin. 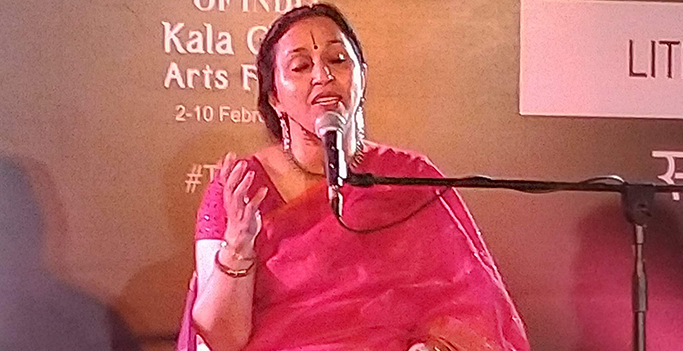 We then moved on to Dharamveer Bharati’s Sudha whose is a more layered and complex story, a personification of a man’s ideal woman, to which Vidya Shah harmonised with Begum Akhtar’s Patli Kamar Lambe Baal, Kamala Jharia’s Na Tum Mere Na Dil Mera and finally closed the show on a high note with Begum Akhtar’s Aye Mohabbat Tere Anjaam Pe Rona Aaya. 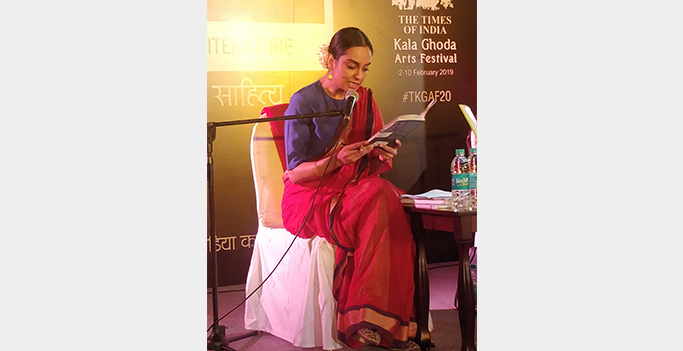 The readings by Priyanka Setia left the audience wanting more as she teased them by withholding the end. 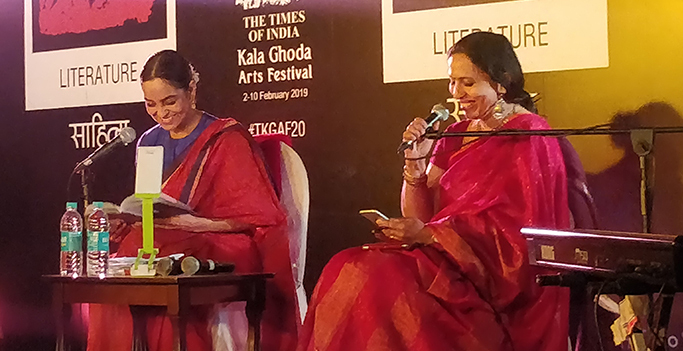 Vidya Shah’s mesmerising voice with a varied selection of songs blended with the women characters being read effortlessly, adding charm to the classic Indian writings and experiencing Mitro, Karmelin and Sudha — the three women from Indian literature in an entrancing way. 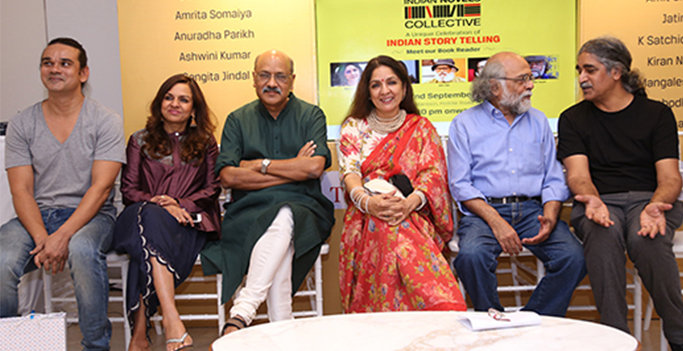 The characters indeed, came alive and left their imprints on the minds. 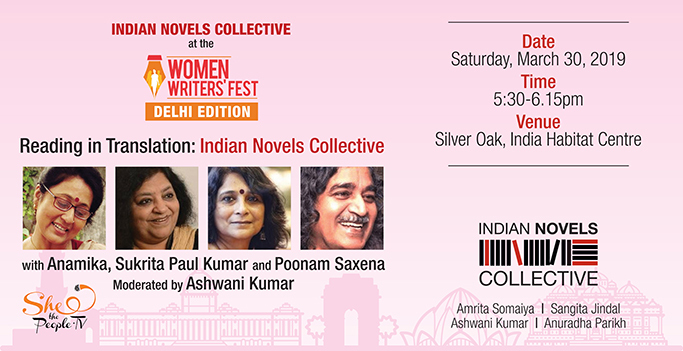 The enchanting fusion of music with literature at the event yet again created a remarkable narrative, a narrative upholding the uniqueness in the portrayal of women, acknowledging the differences and bringing out the complexities in Indian literature.